Once more I display my mastery of photo journalism with this snap of Shaun Bailey - handy guy for True Blues to have under their banner - Angela Harvey, Westminster's cabinet member for housing and The Blond at the Royal Institute of British Architects this morning. It's in Portland Place, the walls are all wood-paneled, you know the score. To listen to the entire proceedings CLICK HERE. "A huge affordability gap in which the average house price is now 13 times the average salary, the average price paid by a first-time buyer rose 15 percent last year to £287,000....when you consider the surge in house prices against average wages, you can see why there's been a 40% decline in first time buyers in the last five years." 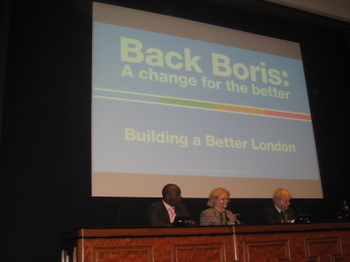 Citing London's particular problems, he proposed a "first steps scheme," for people paying the basic rate of income tax but not qualifying to special government schemes. He said he'd release GLA land "capable of accommodating tens of thousands of homes and transfer it to community land trusts," to be managed by housing co-ops. "All the evidence," he said, "is that housing estates run by tenants feel safest and are the safest." Committing himself to increasing affordable housing levels, he nonetheless attacked Livingstone's 50% rule as overbearing and ineffective, pledging to allow boroughs more autonomy in pursuing the "affordable" goal. Under Mayor Johnson there would be an audit of London's 84,000 empty homes and an additional £60 million provided to bring them back into occupancy. He spoke of encouraging innovative solutions to create homes of individuality and character, citing a scheme in Wandsworth involving "flipping the lid off an underground car park." There was much praise for architect Wayne Hemingway's developments in Dartford - so that's what he was doing there the other day - a pledge to end the selling-off of private gardens (cries of "Hear! Hear!") and to protect small shops and historic views. Tall buildings were fine, "in their place," but not if locals didn't want them and he stressed the need for more transparency in the application process - spot the Ronson reference. There was then a dull question from me about tall buildings and interesting ones from the Empty Homes Agency, a Merton Councillor, LBC and others. Johnson's answers to these confirmed the general impression of a finely-tuned political package that is long on "practical" small measures and short any anything radcial enough to be called mad. Not that housing is my long suit. Still, I've found out what the Merton Rule is. P.S: I missed the first minute of Shaun Bailey's opening remarks because I didn't press the "record" button hard enough. I did, though, jot down the words "change" and "out of touch." Message received? The link to the housing manifesto just goes to the merton rule page. Thanks Alan. Forgive my careless error. I've corrected it.